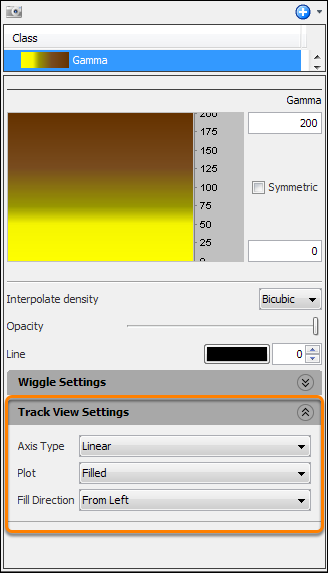 You can configure the display settings for well curve that is associated with the class in the track view. This is useful when you are viewing multiple well curves in Well Correlation. Expand the Track View Settings section in class settings to configure the settings. In the tree, select the class which you want to define the track view settings. Axis Type — Select Linear to display curve in linear scale or Log to display curve in log scale. Plot — Select As Line to display curve in lines or Filled to display curve in filled colours. Fill Direction — If you are showing the curve in filled colours, select From Left to fill the curve from the left or From Right to fill the curve from the right.